Brainwashed - Glenn Jones, "The Giant Who Ate Himself and Other New Works for 6 & 12 String Guitar"
Glenn Jones, "The Giant Who Ate Himself and Other New Works for 6 & 12 String Guitar"
Every couple years or so, a new Glenn Jones album modestly enters the world, unveiling a fresh batch of warm and lovely American Primitive-inspired guitar works. 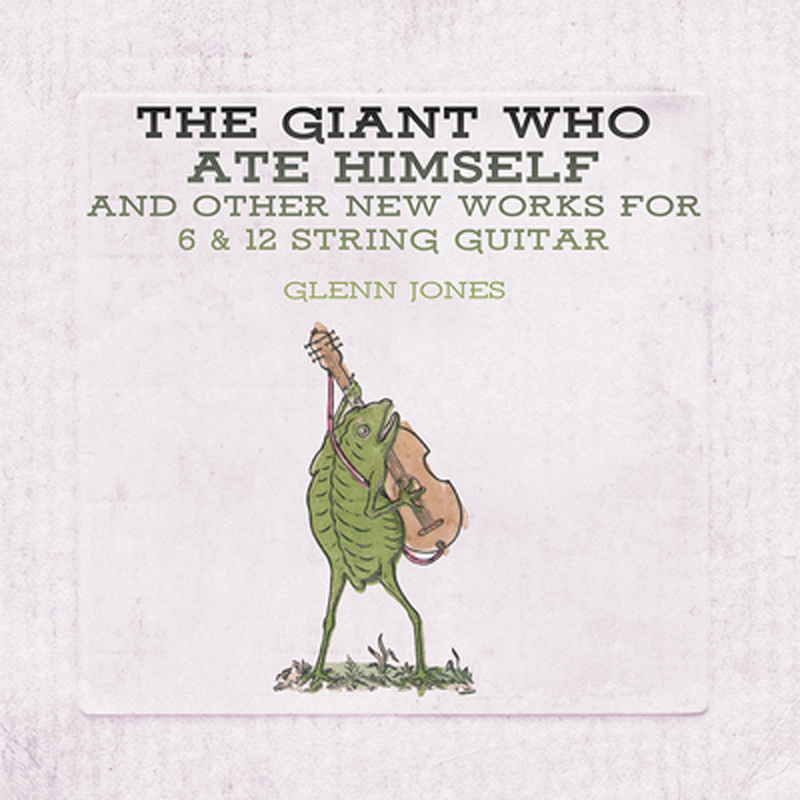 Appropriately, The Giant Who Ate Himself is a reference to Jones' longtime friend and mentor John Fahey, who certainly casts a formidable shadow over much of the more compelling acoustic guitar music in his wake. More than anyone else, however, Jones seems like the underappreciated (yet considerably less hostile) spiritual heir to Fahey’s throne, though Jones is far more of A Comparatively Well-Adjusted Artist Who Reliably Releases Good Albums. Of course, the American Primitive aesthetic quickly became much larger than Fahey himself and it is all too easy to fall into the trap of legend worship–there is a much larger tradition of great and visionary American acoustic guitarists that continues to thrive and it would be more accurate to simply state that Jones is one of its unbending pillars. Trends come and trends go, but Glenn Jones remains a timeless, distinctive, and consistently delightful presence through it all. I have always found it incredibly difficult to articulate what separates a great acoustic guitar composer from a merely technically gifted one, particularly when their aesthetic is an extremely traditionalist one. For the most part, The Giant Who Ate Himself falls into that category, as there is little that Jones does that someone could not have done sixty years ago if they had ingested a healthy enough diet of country blues. The difference between great and good in that milieu largely lies entirely in abstract concepts like soulfulness and a host of small intuitive decisions that cumulatively amount to something truly significant. On a great acoustic guitar album, songs do not overstay their welcome, the pacing never feels sluggish, the melodies are strong and lyrical, there is depth beyond the central melody, there is a lightness of touch, and a song's essence is never muddied or obscured by clutter or needless flourishes of virtuosity. Jones' work eternally ticks all of those boxes for me, but he also manages to occasionally evoke a poignant scene or memory. Characteristically, a number of these pieces have actual stories behind them: "From Frederick to Fredericksburg," for example, was inspired by a road trip with Jack Rose, while "A Different Kind of Christmas Carol" has an amusing backstory involving a young audience member who did NOT share Jones' curmudgeonly opinion of the holiday. Such tales certainly provide some wonderful added depth and color to Jones’ live performances, but he also achieves the deeper and more impressive feat of making these pieces *feel* like impressionistic stories whether I know what inspired them or not. Conceptual art aside, a relatively sensitive and intelligent listener should not have to read the liner notes or a press release to understand what makes a piece of music intriguing. For example, I have absolutely no idea what Jones was thinking about when he composed "The Was and The Is" (the merciless passing of time? ), but its winding and bittersweetly lovely melody is probably evocative and vivid enough to conjure different images for anyone listening. Aside from that piece, however, there is a curious divide in which the less structured and more spontaneous-sounding pieces feel like the most soulful ones, such as the slow-moving "Even The Snout And The Tail" and the brief and mysterious sound-collage "River in the Sky." Those are not necessarily the best pieces on the album, yet they are the ones that resonate most strongly with me. The other highlights, such as the title piece and "The Last Passenger Pigeon," are a different kind of delight, as their sprightly pace, clear melodies, and tight structures converge to make them feel like fresh classics of the genre destined to become standards. I certainly like those pieces as well, but there is an interesting push-and-pull between pieces that feel like guitar music for other guitarists and pieces that feel like Jones is straining to transcend the perceived limitations of solo acoustic guitar music. In the context of Jones' existing body of work, there is nothing particularly revelatory that makes The Giant Who Ate Himself tower above any of his other albums as an especially essential release, but that is not something he seems to have any interest in striving for and I genuinely appreciate that unwavering constancy: each new album merely feels like old and familiar friend dropping by to share the latest chapter in the story of his life. There is a deep warmth, humanity, and sensitivity to Jones' best work that is very hard to come by in instrumental music. While I suppose a consistently enjoyable artist releasing another consistently enjoyable album is not exactly headline news, I nevertheless find Jones' passion and unwavering devotion to his anachronistic craft to be quietly heroic. I very much appreciate that he is keeping the torch of the American Primitive and steel-string traditions burning bright. More significantly, however, Jones is clearly striving to build and expand that canon with each new release. It is a slow, steady, and unsexy life's work, yet he has never stopped moving forward and The Giant Who Ate Himself adds another handful of gems to Jones’ steadily growing pile.